Yesterday we spoke about Gujrati Dhoklas , today I will tell you about another Gujrati farsaan called Khandvi. This is a very light snack and is made with gram flour and curd. The batter is made and then seasoned . It is then cooked , till it gets thick and turns into a mass. This is then spread on a kitchen counter or inverted steel thalis. Strips are cut , rolled and finally tempered . Making Khandvi is actually not easy , it is quite tricky . I guess I have made it just three four times ever since I got married . We get excellent Khandvi in the market so I have never been very keen on making . At the same time I wanted to document this recipe so decided to make it. This is my Day 3 post for Special Theme. Grease a couple of steel thalis or a marble counter. Grind chilly and ginger to a fine paste. Drive gram flour and mix with yogurt to a smooth paste adding half a cup of water. Mix turmeric powder , salt and lemon juice to the batter. Cook this mixture in a thick bottomed vessel . Stir continuously till the mixture turns into a thick lump of mass. This shall take a while , so be patient . Test check by inserting the spatula upright in this mass. If it stands straight at a right angle you can be sure it is done . The other way is to spread a teaspoon and wait for a minute or two , if it comes out like a film it is done . Quickly spread out about one big ladle ful at a time on the inverted greased thali or on the marble counter . Spread as thin as possible . Let cool and then cut into 2″ wide strips. Assemble them in a tray and sprinkle red chilly powder. Heat oil , add mustard seeds , let splutter then add asafoetida , green chilly and finally curry leaves. Sprinkle on the prepared khandvi . Sprinkle scraped coconut and coriander leaves. Sieve gram flour and mix with yogurt to a smooth paste adding half a cup of water. Let cool and then cut into 2" wide strips. Lovely snack – has been on my To-do list for a long time .. I absolutely love khandvi.. You have got those rolls perfect! Yummy.. love it . I just some yesterday as my son loves this snack. My MIL used to make excellent khandvi. Never got to learn it under her. You have done such a lovely job here. Wish I was there when you were making it. 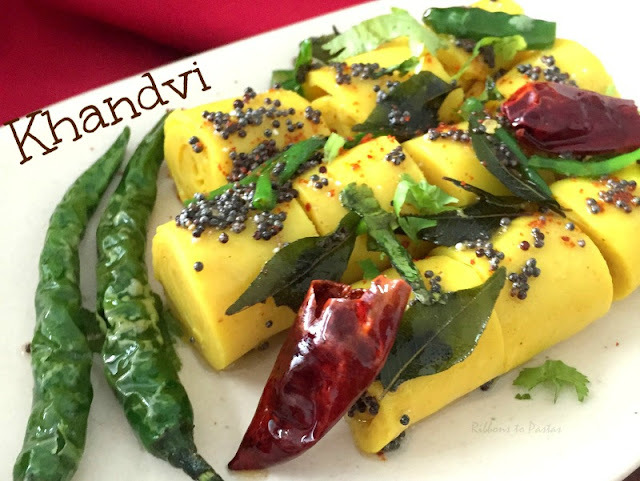 Give me a plate of this alluring khandvi, i can finish that whole plate in no time. My all time favourite. I love the variety of gujarati snacks – just awesome! My fav snack. Those rolls are so perfect. I am drooling over those scrumptious khandvis. It’s been ages since I made them.